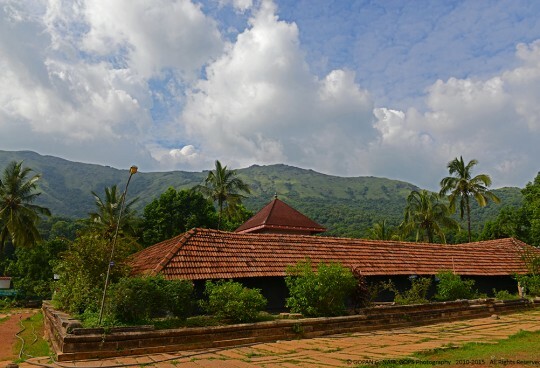 Kodachadri peaks in the Western Ghats, located in the Shimoga district of Karnataka is undoubtedly one of the most beautiful tourist destinations in India. 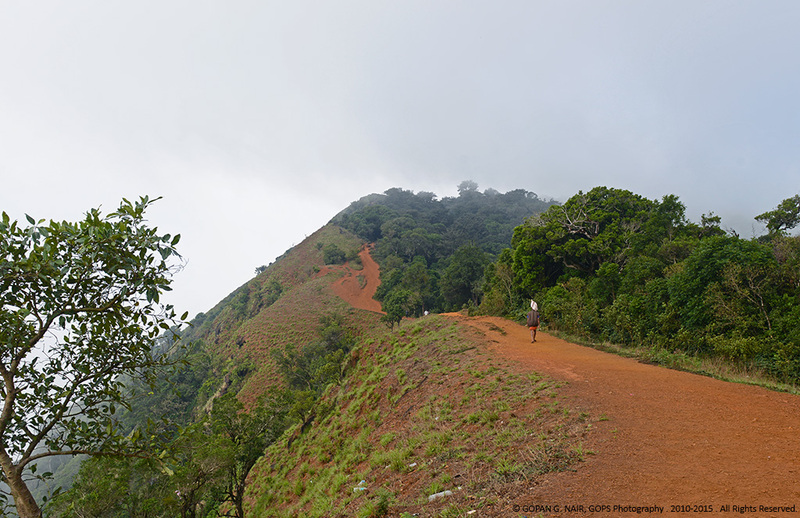 A trip to Kodachadri could be an unforgettable experience for nature-enthusiasts, trekkers, photographers and adventurous drivers. 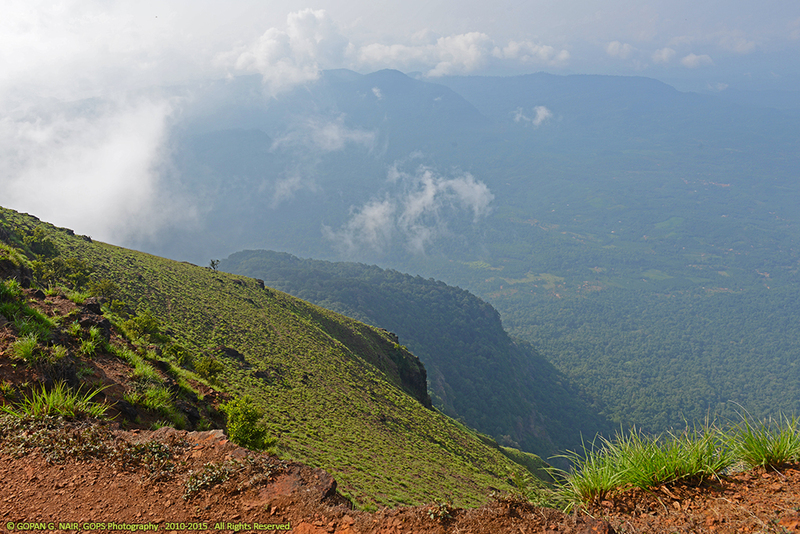 Kodachadri is situated 1343 meters above sea level and around 30 Kms away from the temple town Kollur. 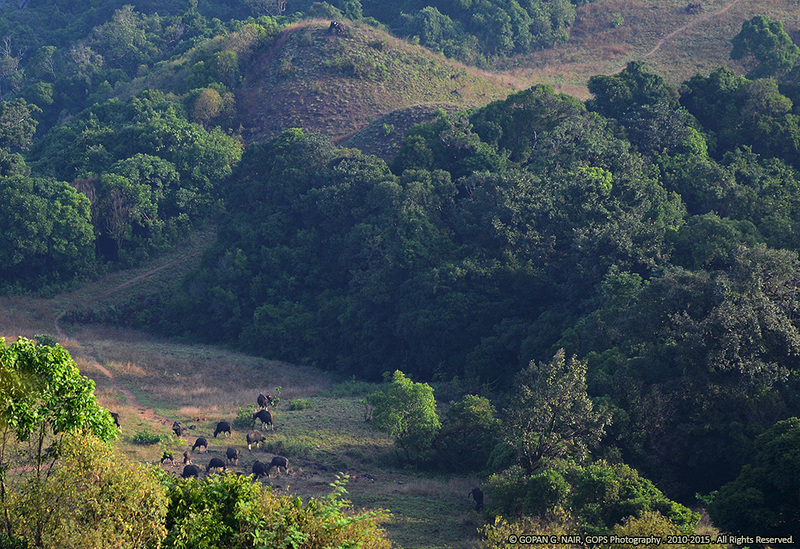 Surrounded by lush green hills, it is home to a wide variety of wildlife and tropical vegetation. 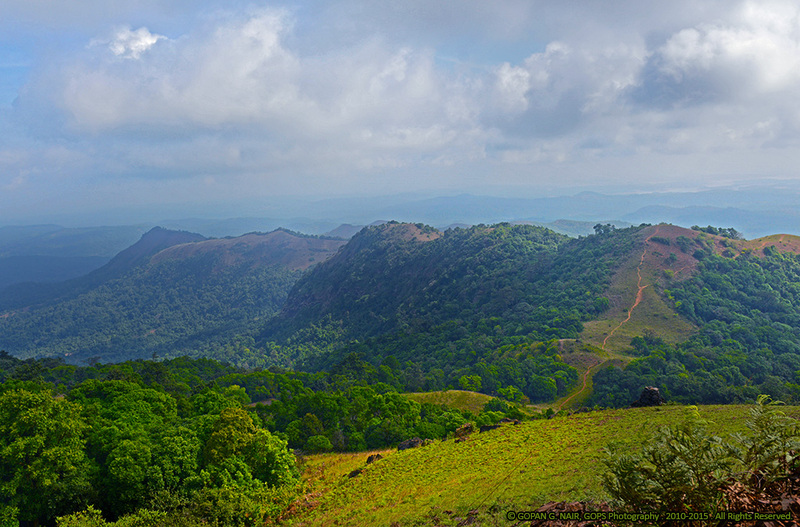 The valley has been declared as a natural heritage site by the state government . 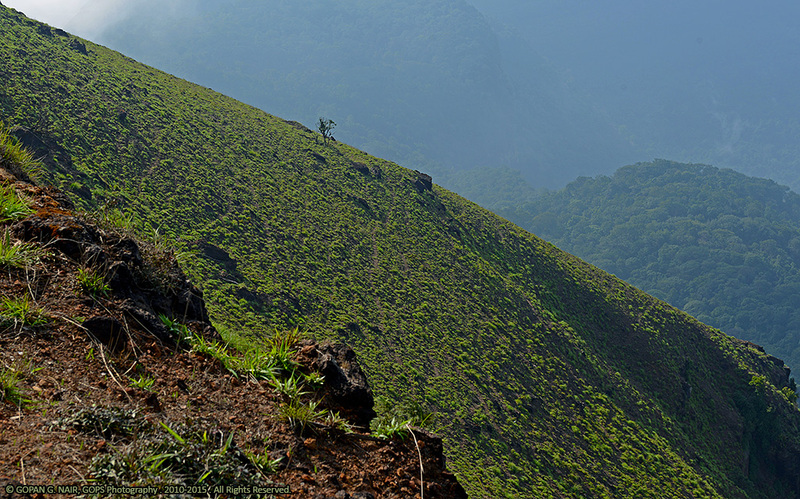 The name Kodachadri (Kodachadri in Kannada, Kutajadri in Sanskrit and Malayalam കുടജാദ്രി) is derived from Sanskrit words ‘Kutaja’ and ‘Adri’ . Kutaja is a kind of Mountain Jasmine flower (കുടകപ്പാല, Kutakappaala or Giri-Mallika) and Adri means hill. Kutaja plant has Ayurvedic medicinal properties too. 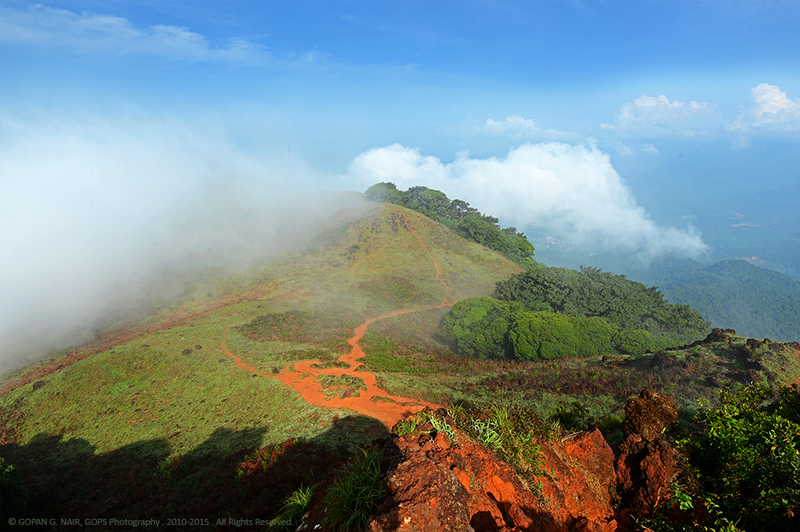 The panoramic view from the top of Kodachadri peak is mesmerizing . 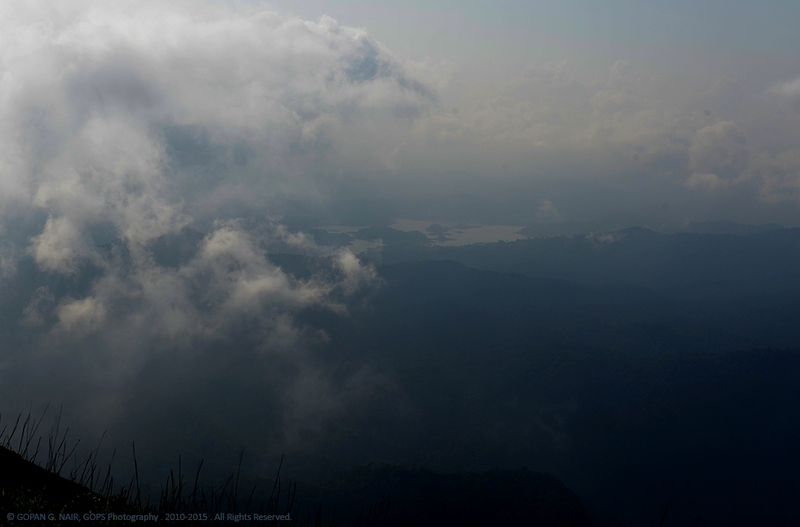 The mountain top is accessible by an adventurous trekking trail of around 9 to 12 km through dense forest. 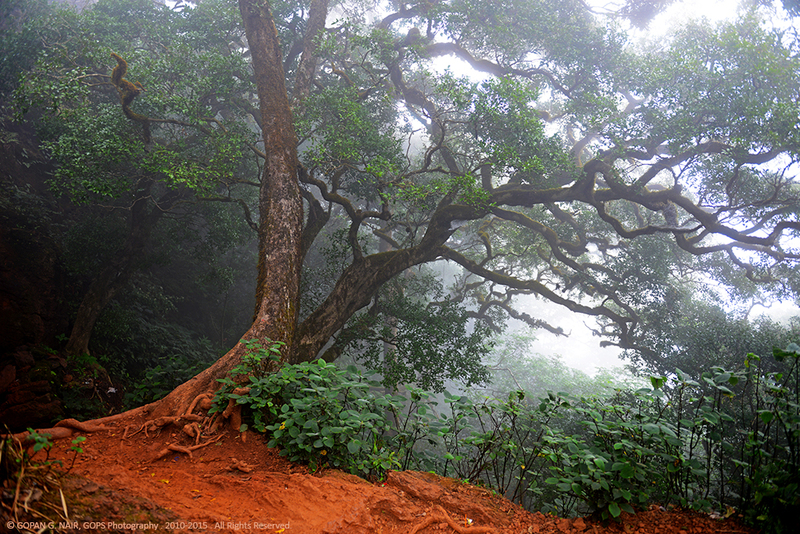 This trek is meant for physically fit people and requires special permission from the forest department. 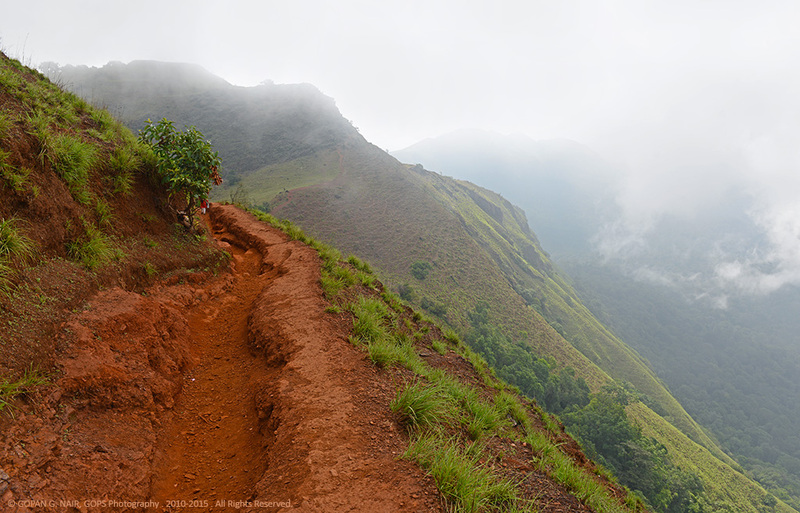 It could also be reached by an off-road jeep route of around 30 Km from Kollur town. 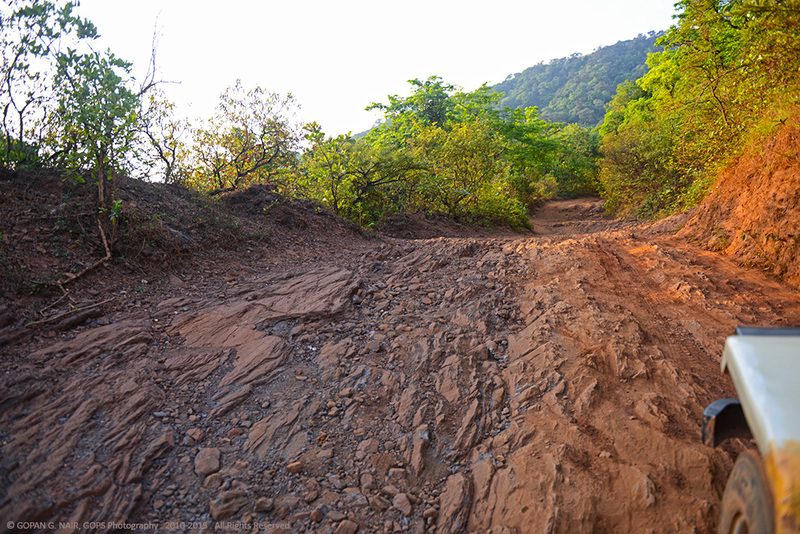 The last 9 Km of this stretch is a very narrow mud track with steep climbs and hair-pin curves. The treacherous trail going up the hill can be conquered by expert off-road drivers only . The local taxi operators drive the good old Mahindra CJ series jeeps and they are well-versed with every nook and corner of the narrow mud road leading to the top of Kodachadri hill. I was surprised to see the way they were negotiating the tough terrain in their 2-wheel drive vehicles. The trick is that they drive non-stop like dare devil maniacs without considering the safety or comfort of passengers. After the trip, the passengers will be like a mangled up crate of eggs. A proper 4X4 jeep could probably negotiate the terrain in a more gentle way . But the local drivers rule the road here and their intimidating attitude could lead to a traffic block anytime in that narrow path. A jeep carries 8 passengers and they charge 350 Rs per head . If you want to travel alone, you may have to pay the full fare for 8 people, ie. 350X8=2800 Rs. We hired a jeep by paying the full amount to carry just two of us . The driver insisted that the ride would be very bumpy due to the lack of sufficient load in the vehicle. We realized that soon, as we started floating around like astronauts in a space station. Our driver did not have an intention to stop anywhere in between the climb and I kept on clicking my camera while jumping up and down. During the drive, we spotted a group of bisons grazing on the grass down the valley. It took almost half an hour to reach the destination. The jeep takes you till the base of the hill from where one has to walk almost 2Km though the forest to reach the top . 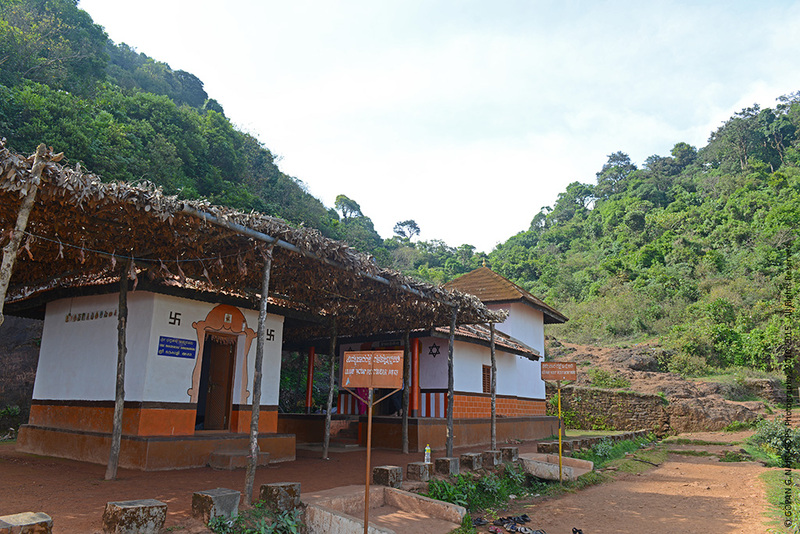 There is a small temple in the base camp which is known as the moola sthana (the origin) of goddess Mookambika . You could get engulfed in mist on the way up. We lost our way couple of times and had to wait for the mist to settle down. On a clear day, Sharavathi river back-waters is visible at a distance in the eastern side of the valley . 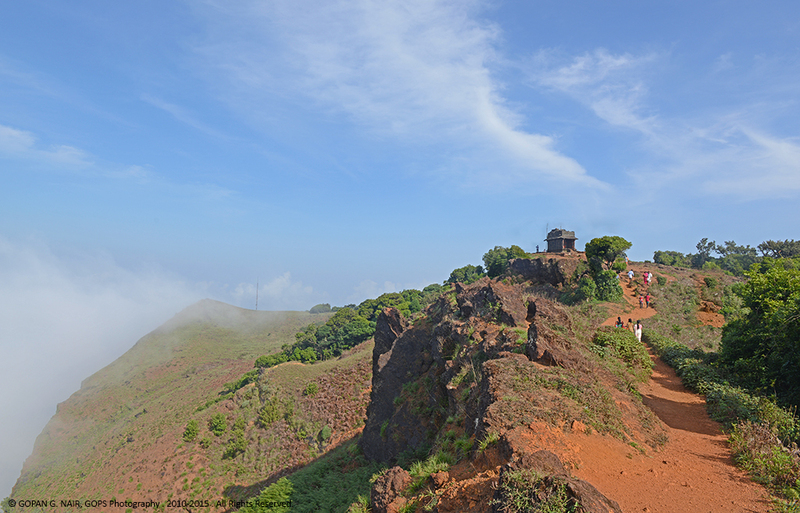 On the other side of the hill, Kollur town and the Arabian sea may be visible at times. 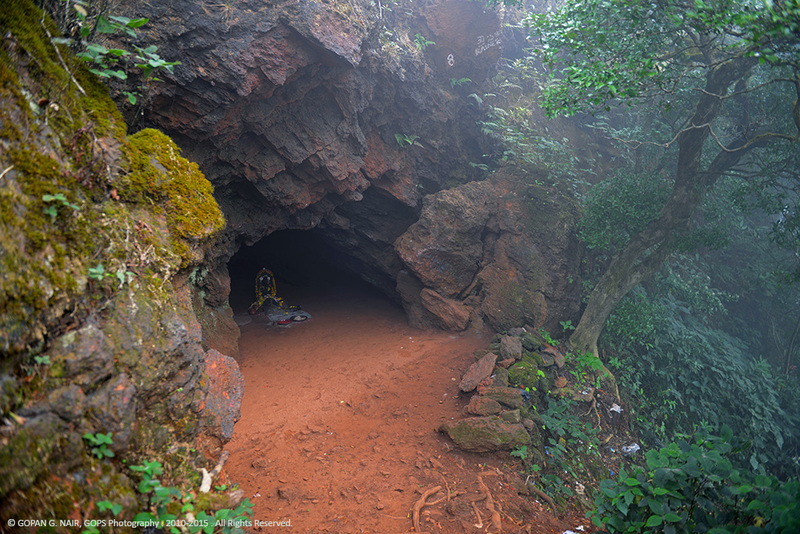 There is a small cave (Ganesha Guha) on the way where lord Ganesha is being worshiped. 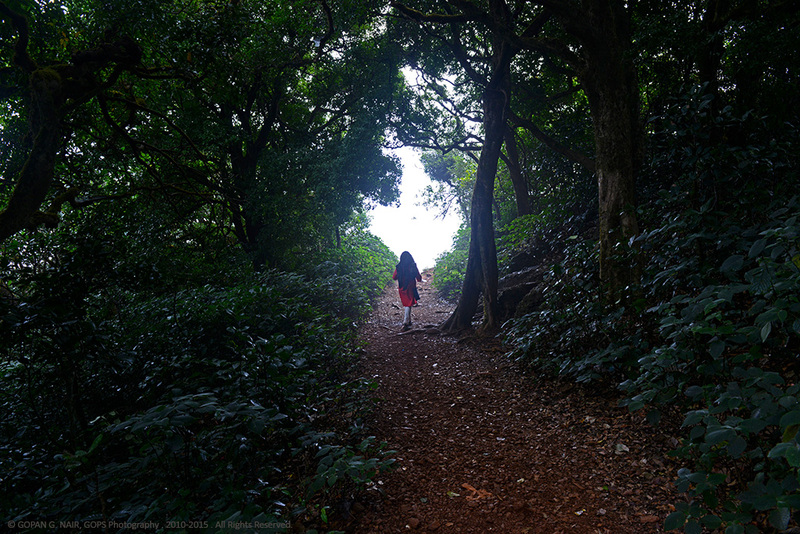 I was fascinated by the picturesque landscapes while trekking towards the tip of the hill. 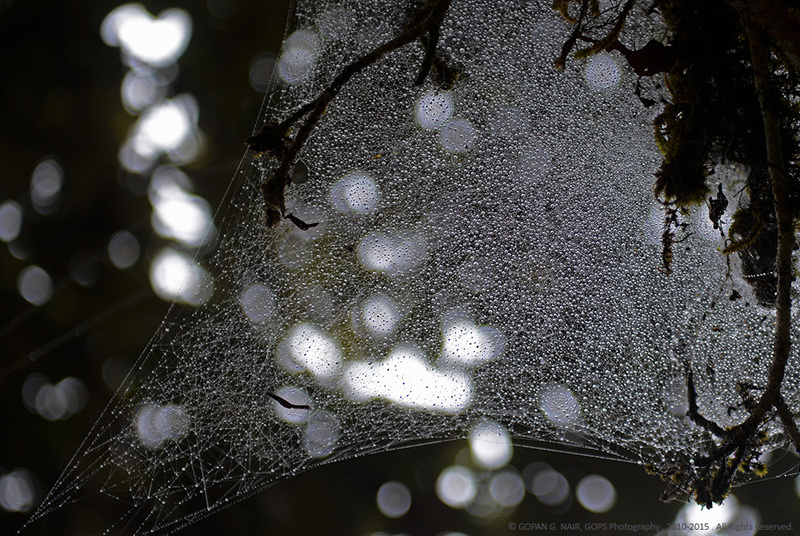 Tiny dew drops sticking to cobwebs and green moss on the trunks of trees en route the jungle trails make it any nature lover’s dreamland. LONELY TREE IN THE MIST. 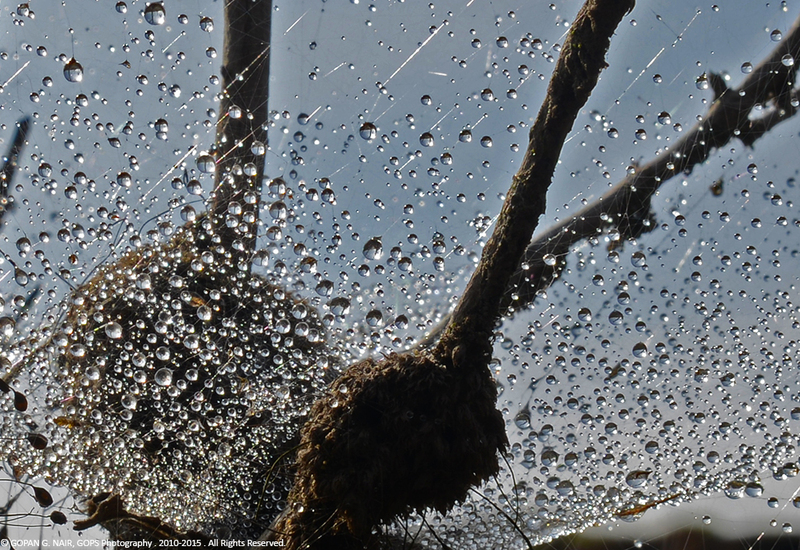 BEHIND EVERY TINY DROP OF WATER, THERE HIDES THE STORY OF AN OCEAN. 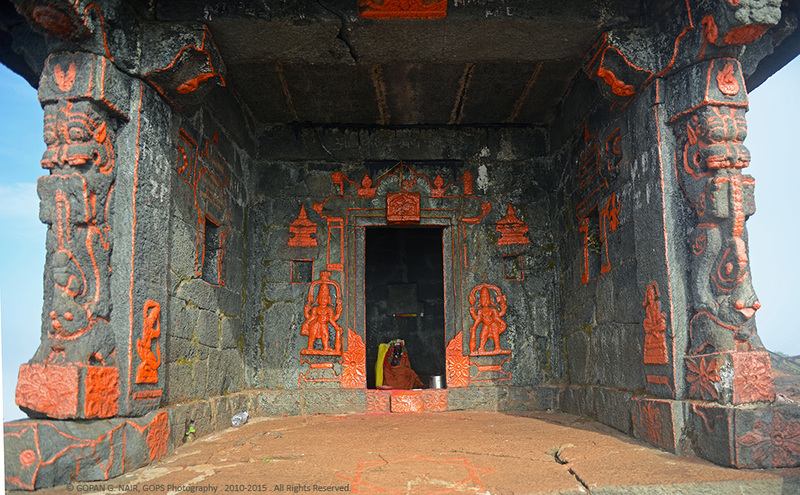 As per mythology, famous Hindu Saint and philosopher Adi Sankaracharya meditated here to get the blessing of Goddess Parvati, and the goddess promised to follow him to Kerala with a condition that he would not look back at any cost. 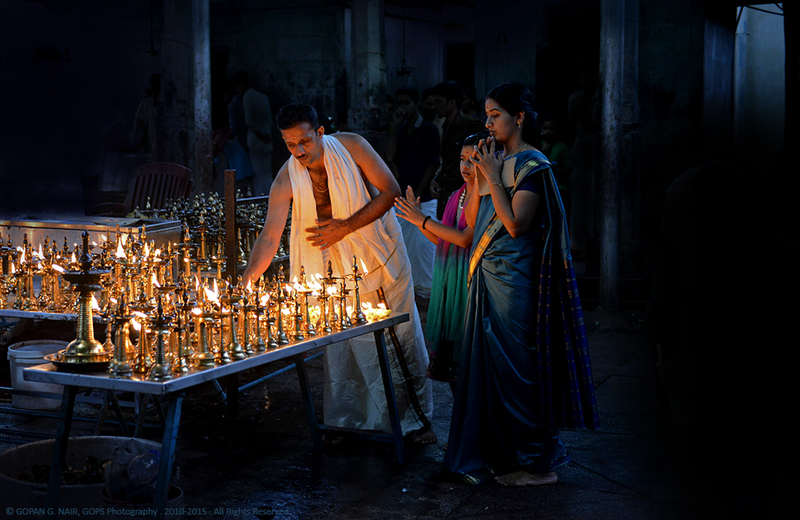 When they reached Kollur, suddenly he was unable to hear the sound of Devi’s anklets. Sankaracharya got suspicious and turned back to see whether Devi was behind him. The Goddess was following him as promised, but since the condition was broken she decided to stay at Kollur . 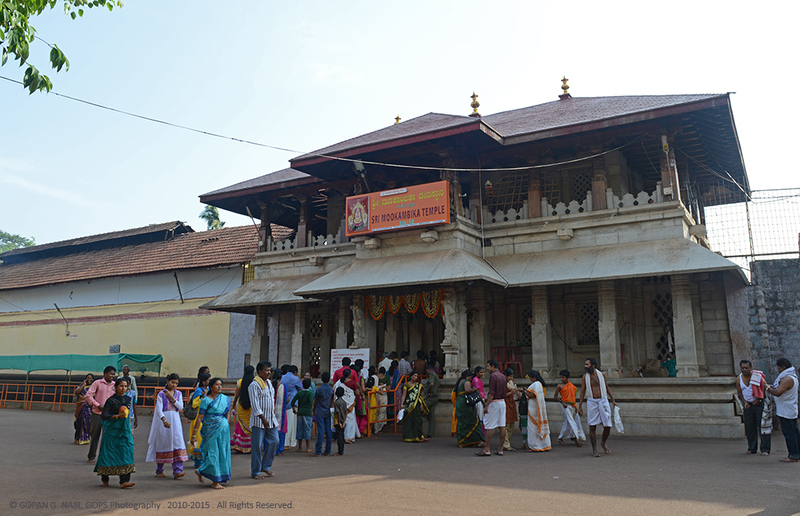 A visit to the Mookambika Devi Temple is incomplete without having a glimpse of Sarvajna Peetha at Kudajadri . 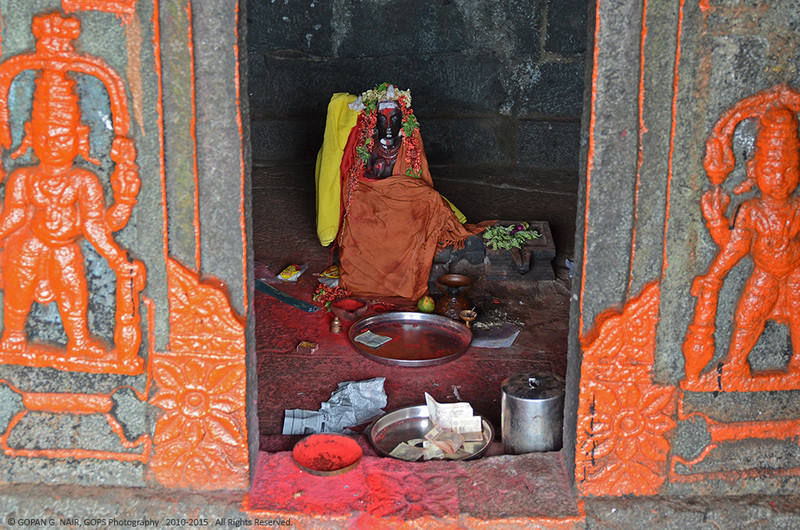 It is a small temple like structure made at the spot where Sri Adi Shankaracharya believed to have meditated. Adi Shankara attained the Sarvajna Peetha or Throne of Wisdom by defeating religious philosophers from around the world during his spiritual journey and ascended to heaven afterwards . Similar structure could be found at Sharada Peeth or Sarvajna Peetha in Jammu and Kashmir as well. I have read controversial statements about the period Adi Sankara lived. It is claimed that he lived during 5th century BC but historians also believe that he lived during 8th century AD. I am not sure which one is the real Sarvajna Peetha mentioned in history. 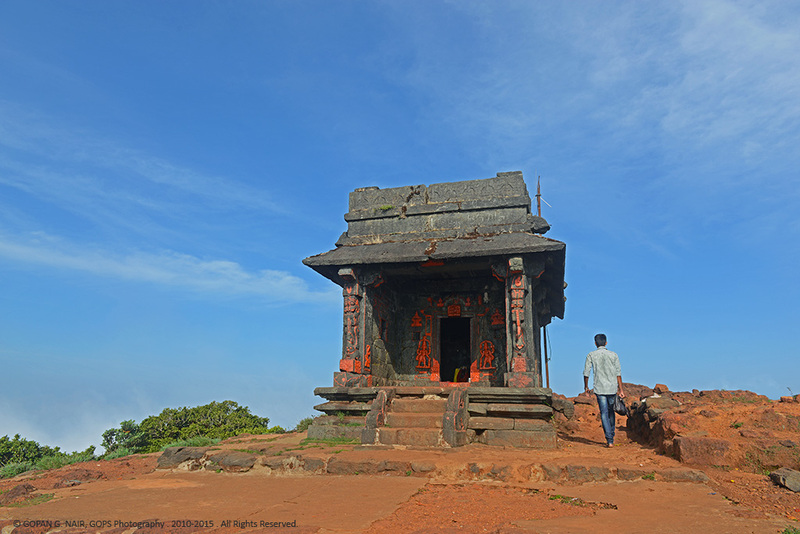 Either way, the temples and structures here are more than 1200 years old. 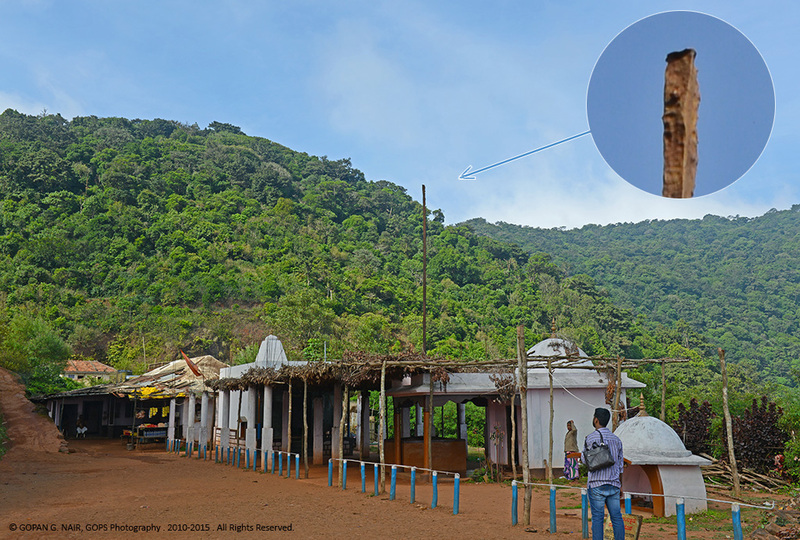 Another miraculous finding is an ancient 7 meter tall iron pillar in front of the base temple (moola sthana). Legend has it that the Goddess Parvati fought with an asura (demon) named Kaumasura (also known as Mookasura) at this location. Devotees believe that it is the spear (trishula) she used to kill the asura and driven it into the earth afterwards. 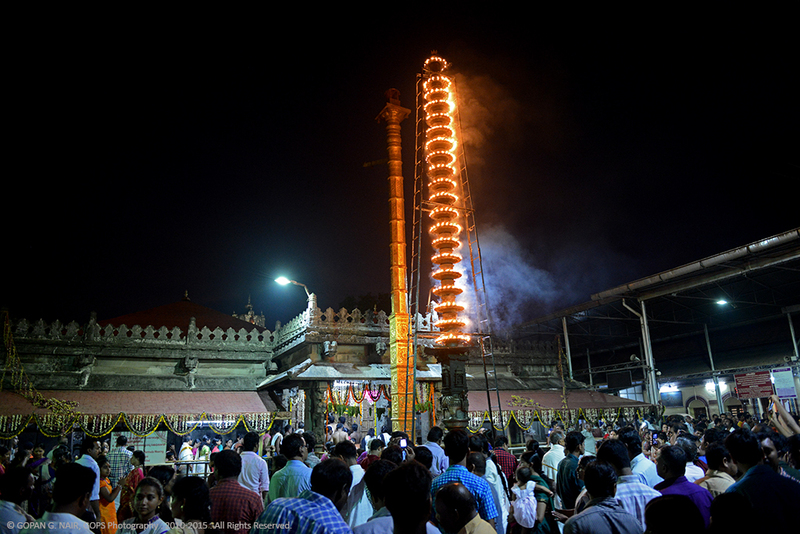 The Goddess was known as Mookambika later. I was told that the trident head of the spear is still underneath the soil. Whether the story is true or not, this iron pillar has not corroded after thousands of years of exposure to heavy rains and other extreme weather conditions in the area. Several institutions have conducted scientific studies and proven that the material is pure form iron made though ancient metallurgic process not known to modern science. 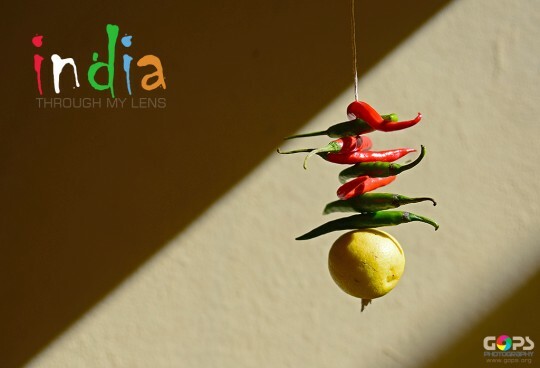 Indian Institute of Science ( IISc ) has conducted some preliminary studies on this subject which could be found here . 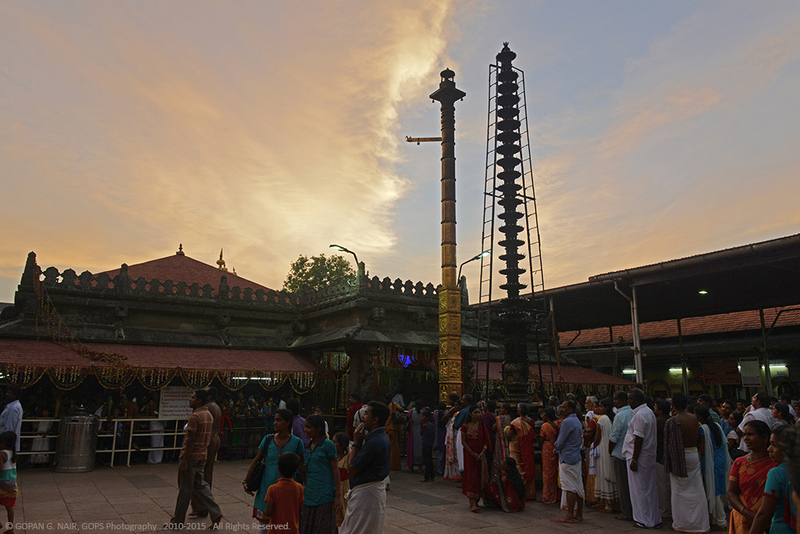 THE IRON PILLAR AT MOOLA STHANA (THE BASE TEMPLE) OF GODDESS MOOKAMBIKA. 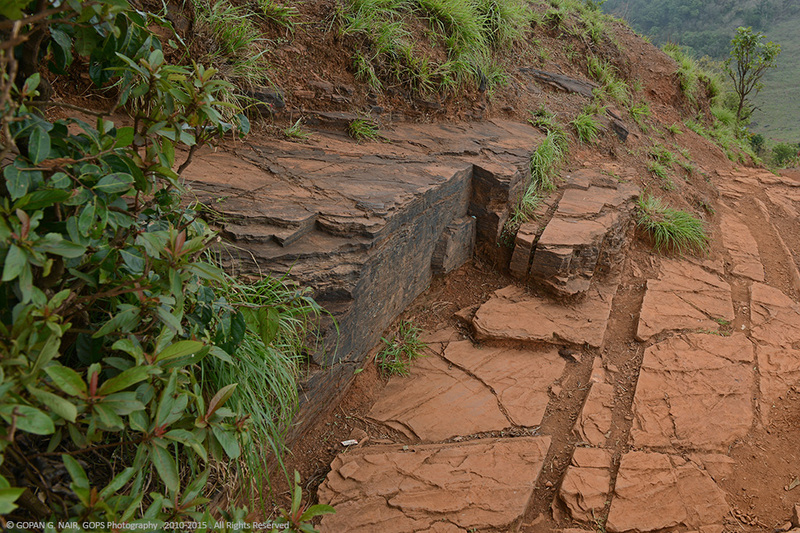 The sedimentary rocks such as quartzites in Kodachadri hills contain a fair amount of iron ore. It is evident from the colour of the stones and as well from its magnetic properties. Though mining efforts were initiated, the companies soon had to withdraw due to the strong objection from environmentalists and native people. We spent the afternoon at Kollur Mookambika Temple. 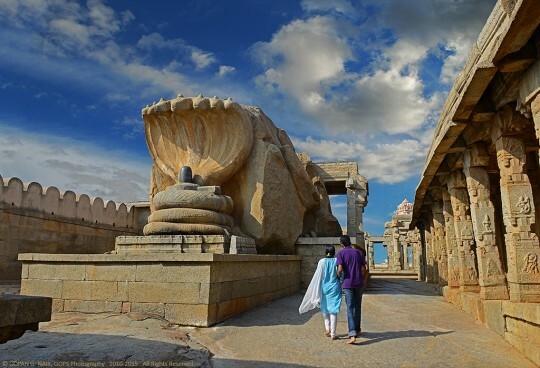 This temple is most famous for its Saraswati worship in Southern India and it is a sacred destination for artists and students from different parts of the country. 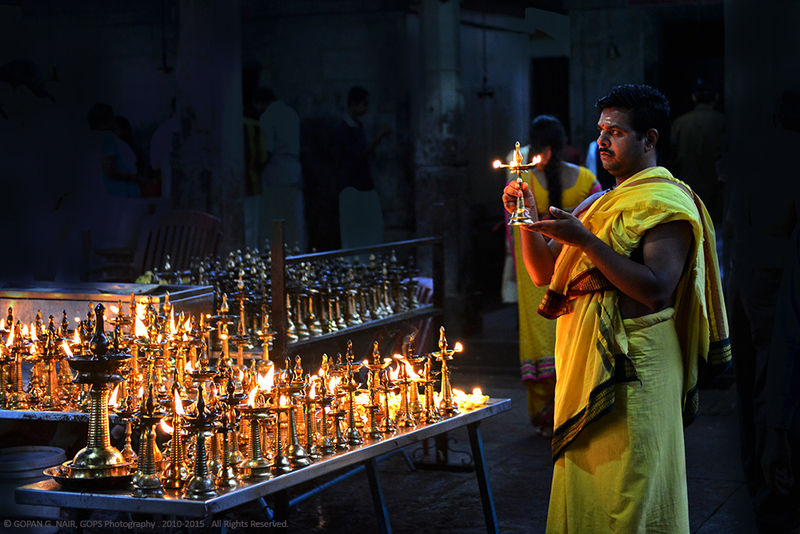 Half of the devotees are from Kerala, the remaining are from Tamil Nadu and Karnataka. 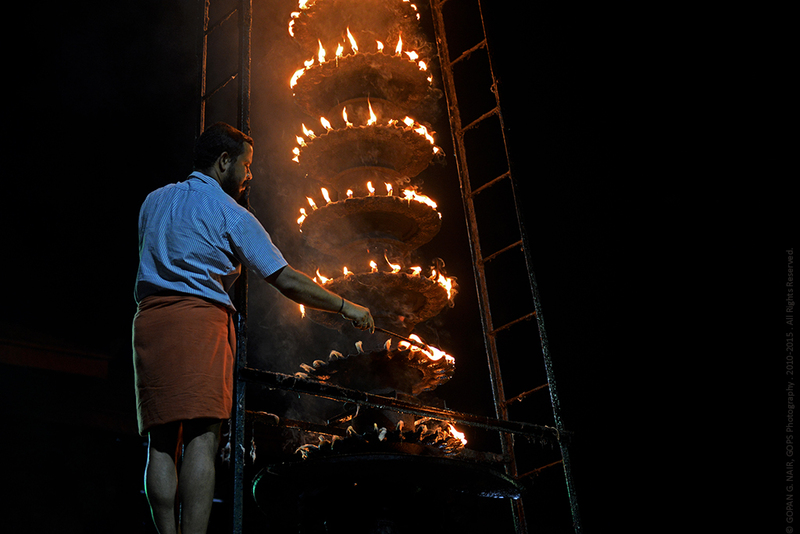 Most of the performing artists come over to this auspicious location for their first stage performance (Arangettam, Arangetram) . It was really fascinating to watch some little girls performing Bharatanatyam dance in front of the Saraswati Mandapam. 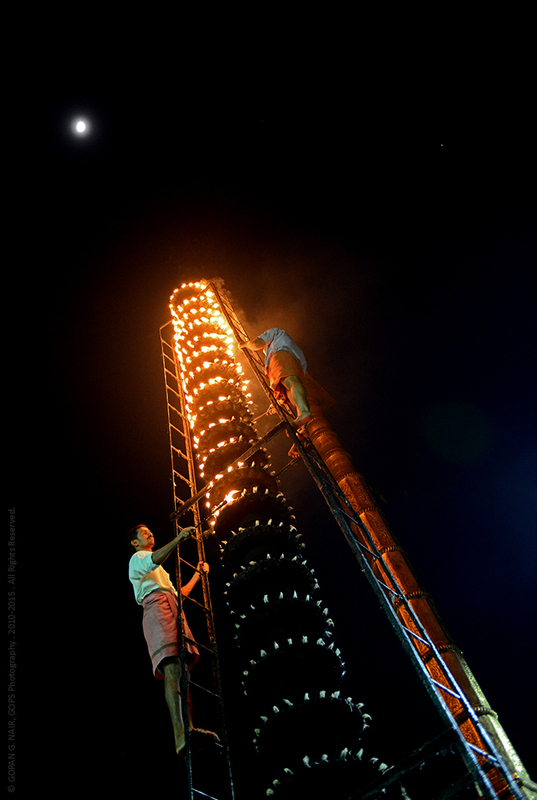 In the evening they lit up the tall Deepa Sthambha (oil lamp pillar) at the entrance of the temple . 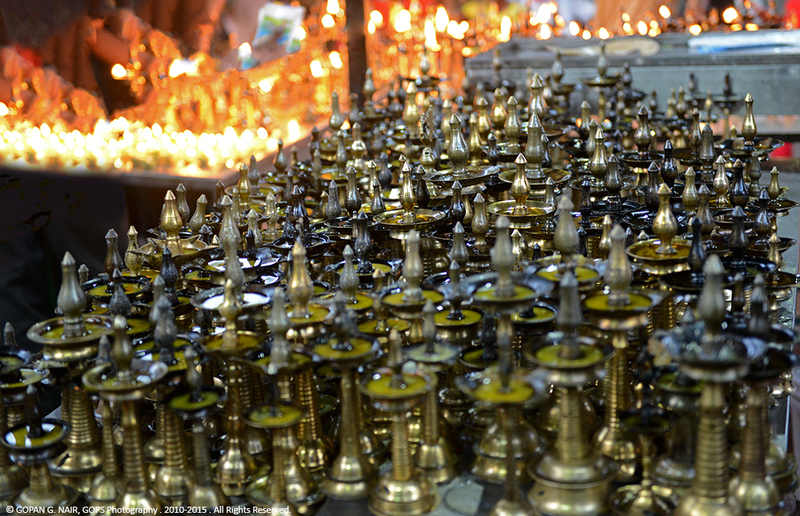 View of the temple illuminated by the traditional oil lamps was spectacular. Route-1 : (Distance 438 Km) Bangalore – Nelamangala – Baragur – Arsikere – Shivamogga – Ayanur – Nagara – Kollur. Route-2 : (Distance 438 Km) Bangalore – Nelamangala – Tumakuru – Shivamogga – Ayanur – Nagara – Kollur. Route-3 : (Distance 129 Km) Mangalore – Kundapura – Kollur. 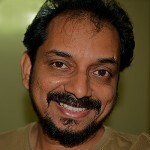 (Distance 37 Km) Kollur – Nittur – Kodachadri. 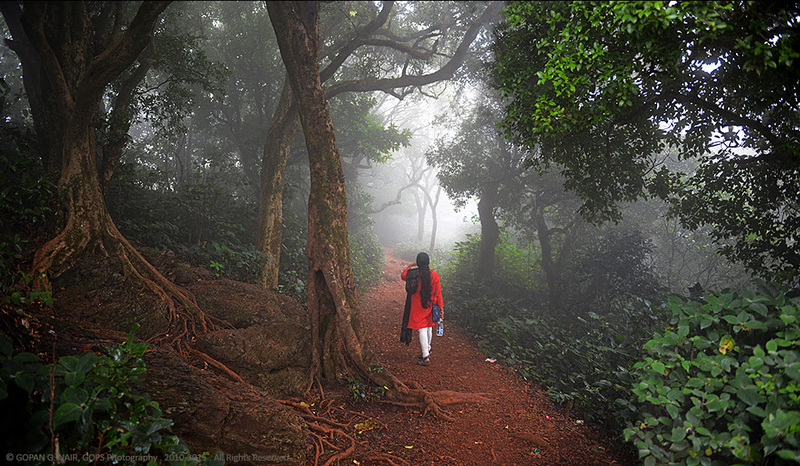 A fabulous trip up the Kodachadhri hills, Gopan !!! I felt as if I’m travelling with you !!! Great pictures too !!! Thank you very much dear Sir. Appreciate your usual support.